She's Fantastic: Star Wars: The Black Series - PRINCESS LEIA! Star Wars: The Black Series - PRINCESS LEIA! Princess Leia is the Queen of Geekdom. 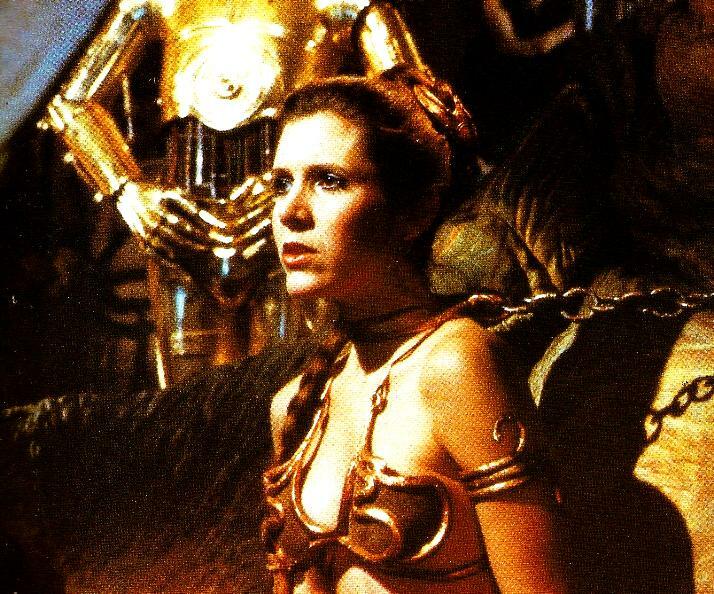 I personally was a fan from the moment she first she mocked Luke on screen, but for the moviegoers who might have been withholding their adoration, the moment she emerged in her infamous Frazetta-styled metal bikini as a slave in Jabba's lair hooked the rest of the world. The bikini even has its own wikipedia page. Despite her high status in geek culture and my own love of her, it's pretty surprising that this is my first Leia action figure ever (not counting a few Galactic Heroes I found in a dollar bin). I guess I was holding out for the best... and honestly I think that was a great decision. This figure is beautiful. I'm not a fan of the sloppy cloth skirt or the too-stiff chain and ponytail, but overall those really aren't big detractors. I'm excited for the future of this line. Hopefully we see many more figures in this scale and level of detail, but knowing this franchise, any more females will be far far away.... Let's check out Leia below! Again, my two complaints are (1) The cloth skirt looks ratty and frayed. Plus, hopefully over time gravity will let it fold in a more natural way. And (2) The same hopes apply to the neck chain and the ponytail. As of now they are too stiff and look awkward. I love everything about the sculpt of this figure. The likeness to Carrie Fisher is amazing, the costume details are all there, and the articulation causes minimal disruption of the overall form. It's just great. Leia comes with two staff-like accessories (I'm not a fanboy enough to know what they're called). Plus her neck shackle and chain are easily removable. The metal slave bikini was inspired by the fantasy art of the late Frank Frazetta. Here is an example of the many many many metal bikinis in his paintings. She is your first Leia figure of your first Star Wars figure? There is a wealth of cool female figures in the 3.75" Star Wars line. I received 6" Leia & Han recently. Quite impressed by both, especially Han. I'd say Leia in white & a few versions of Padme Amidala will arrive sooner than later. No No no.. just my first Leia. I actually did a fun post on my Star Wars collection a few years ago::: (( http://www.shesfantastic.com/2012/02/unknown-women-of-star-wars.html )). Yeah, I guess we will be seeing some more Leia variations. I always liked the Hoth outfit best! Ah, I didn't think you'd miss out on all that Star Wars awesomeness! I soo need Jes Gistang the female stormtrooper. Jocasta Nu is also on my list. Not sure which of Leia's outfits I like best. I do like the white jumpsuit she wore on Cloud City (I think it was Cloud City). The Hoth outfits are cool too. Most iconic is the white dress with the famous buns, so that will make an appearance no doubt. Actually, I don't know where you live, but this Leia seems to be quite a shelfwarmer around here. Most stores (Targets, TRUs, and KMarts) seem to have an abundance of her. It's good because you don't have to feel pressured about grabbing her, but bad because it might discourage future females in the line. I was just looking at this figure in K mart but I wasnt ready to pull the trigger on it because of the hefty price ($24.99) without seeing it out of the pack first. I thought to myself Ill just go home and see if shesfantastic has covered this one yet and make my decision from there. As normal you haven't failed me! Im now ready to spend a considerable amount of my monthly budget on this figure based on your always amazing photos.Your blog really is my favorite place on the internet. Did you see the pics of the Leia in Boushh Disguise from NYCC? I'm excited to get her. Glad you liked this review. $24.99 is pretty hefty for her though, did you try looking for her cheaper? I think I've seen her at Walgreens and Target. And she's $17.99 on Amazon. Yeah Im not really a Star Wars fan (explains why Im nearly a year late on this figure) so I hadnt really shopped around for her, it was more of a Im her she's her type thing.I think ill check a few other places before I go back to Kmart.